The US fielded a small military force at the time. This results in them having fewer Units at the start of the game. However, as seen a few decades earlier during the Civil War, the US is able to rapidly ramp up their production capabilities and quickly expand the size of their army. As the game unfolds, the US receives production bonuses to reflect this. The geographical area represented by the US map is larger than in the other games, as such, each Martian Wave is made up of 5 Tripods, and they tend to move a little less often. To match this, the US must pay 3 PP to move Units during the Production step. The US game gives a more lumbering feel with large forces bashing against each other. 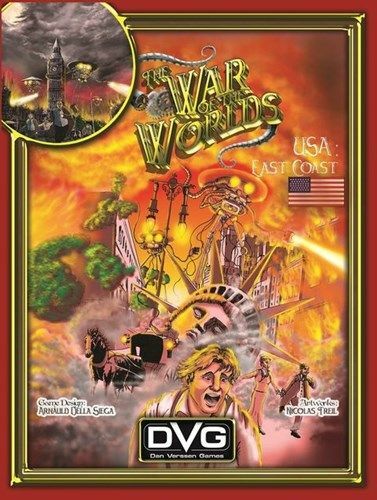 The War of the Worlds is a solitaire board game that puts you in command of the Human forces in a desperate attempt to defend Earth against the invading Martian Tripods! While you plan and carry out the Human side of the war, the game system commands the Martian forces. 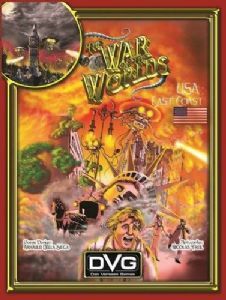 The War of the Worlds is a solitaire, low complexity board game. Each games takes only an hour or so to play.